A subquery is a query that is nested within another query. ​Copy and run the SCHOOL table from the yellow box below if you haven't done so. ​The SCHOOL table contains a list of 20 students. Let's assume we'd like to retrieve students who have an above average height in the class. Now, we will filter the table and display only students whose height is above average (i.e. 59.66). The program works. However, it requires us to manually compute the average student height (i.e. 59.66 inches) before manually entering it into the program. This program will not work when the data set is updated with a different set of data. A better approach to writing the program is to use a subquery. The Proc SQL step above contains a subquery in the WHERE clause. The subquery is evaluated first. It returns the average student height in the WHERE clause. The WHERE clause then selects the rows where the height is above the computed average height. 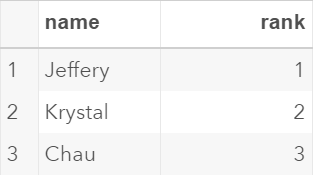 A subquery can also be used to look up data from a different table. 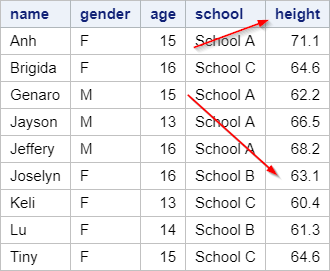 Now, we'd like to have a table that displays the background information such as the age, gender, school and height for only these three students. We can create a query on the SCHOOL table with a WHERE clause that selects the students from the AWARD table using a subquery. ​The subquery in the WHERE clause selects the names from the AWARD table, which are Jeffery, Krystal and Chau. Write a Proc SQL step to display the average car price (MSRP) for each car maker. Filter the output and display only the car makers whose average car price is above average.